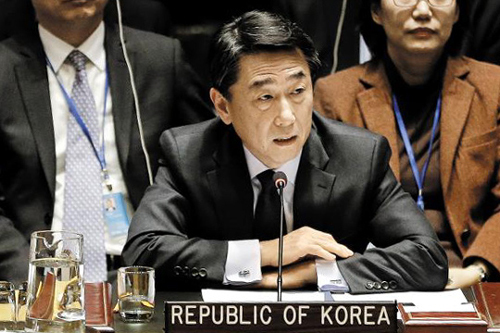 A speech by South Korea's ambassador to the UN before the Security Council on Dec. 22 condemning human rights abuses in North Korea has gone viral on the Internet. "When we first came to the Council two years ago, one of the first issues we tackled was [North Korea's] nuclear and missile issues," Oh Joon (59) told the UNSC. "Our term on the council started and ended with the North Korean issue." He added, "Millions of South Koreans still have our family members and relatives living in the North… For South Koreans, people in North Korea are not 'anybodies.'" "Even though we never hear from them, even by now, the pain of separation has become a cold fact of love, just a few hundred kilometers away from where we live, we cannot read what is described in the [Commission of Inquiry on Human Rights in North Korea] report without it breaking our hearts." He said his fervent wish as he wraps up his tenure as ambassador is for the international community to take steps to improve North Korea's human rights situation. An edited version of the speech posted on YouTube has drawn more than 15,000 views in just four days. Oh told the Chosun Ilbo in a telephone interview on Sunday, "I had prepared the speech for diplomats from countries that were not familiar with the situation in North Korea. I’m glad that it gave young people a chance to become interested in North Korean issues." Hundreds of young viewers posted messages on Oh's Facebook page pledging to take an interest in the plight of North Koreans. Oh said, "I felt simply reading the official stance of the government would not be enough to convey the desperation I felt regarding North Korea and sought permission from the Foreign Ministry to deliver some personal thoughts." Oh is a specialist in multilateral diplomacy and has spent two-thirds of his career at the UN and other international organizations.